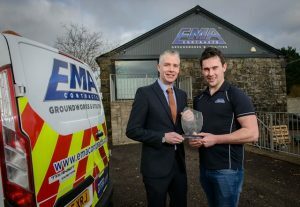 Congratulations to Eamonn McAllister of EMA Contracts who picked up the coveted ‘Business Person of The Year’ award at the recent Mid Ulster Business Awards. Eamonn, who is only 23 years old started his Business in March 2015 and has seen the business grow to a turnover of over £1.5 million with 30 staff employed. Eamonn received support and advice from Workspace, including the development of a business plan through the Invest NI Go For It programme. This helped Eammon secure funding for his business in the early days. Commenting on the award Eamon said “I was delighted to pick up the award on behalf of the whole team at EMA Contracts. It is testament to the hard work put in by everybody over the past 20 months”. He added “Starting off in business can be a lonely environment. Workspace was there to support me in the early stages of the journey” Enda Daly, Workspace also commended Eamonn on winning the award. “From the first moment I met Eamonn I could see a real sense of entrepreneurial spirit and determination within him. Eamonn has proved that starting and growing a successful business can be done at any age. We at Workspace were delighted to see him pick up this award and wish him the best in his future plans”.